« Homepage / Food and Healthy Eating / Recipes / "Redfish on the Half-shell with Jumbo Lump Crabmeat"
The dish is best if cooked on a grill outside or in a well-ventilated kitchen. Start a charcoal fire on the grill and let the coals settle down to a good hot red. Check your redfish for any remnants of rib bones. 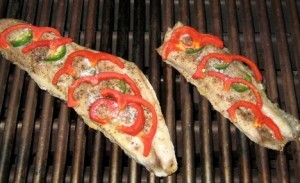 Lightly coat redfish with oil and sprinkle with seasoning mix. 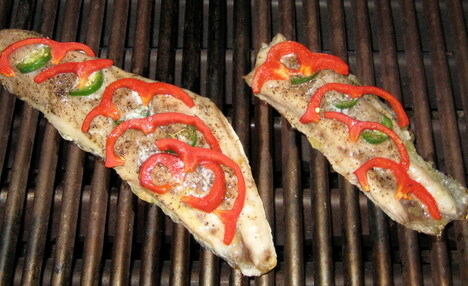 Place the redfish filets on the grill skin side down. Do not turn the fish over, as we will cook it entirely on the skin side thus preserving the moisture and not encumbering the fish with grill flavors. This will take 10 to 15 minutes on a hot grill. While it is cooking, pick the herbs off the stems. Try and use the smaller leaves, but you can also use the larger leaves if you just tear them up a little. Put the herbs into a bowl. Add the crabmeat to the bowl. Toss with the olive oil, vinegar, lemon juice, salt and pepper to taste. When the fish are done, place them on plates and top with the crab salad. I like to serve this with popcorn rice and Chablis. Here you can write a comment to the post "Redfish on the Half-shell with Jumbo Lump Crabmeat"